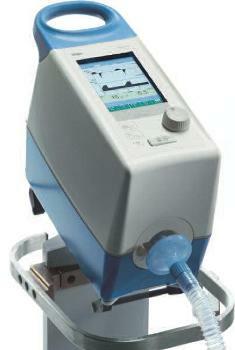 Save up to 80% on pre-owned Dräger Carina ventilators. Dräger’s unique SyncPlus® functionality provides the kind of consistent flow that translates to superior therapeutic benefit, without compromising on comfort. Carina's AutoRamp® feature simulates a natural breathing pattern, which helps optimize inflation flow delivery to the patient. Super quiet blower operation: You will hardly know it is running. Weighs in at 12.2lbs, extremely portable. Internal battery power for an hour or external battery for up to 9 hours.